Ahmedabad: Bajrang Dal activists protested against the film in Ahmedabad today. 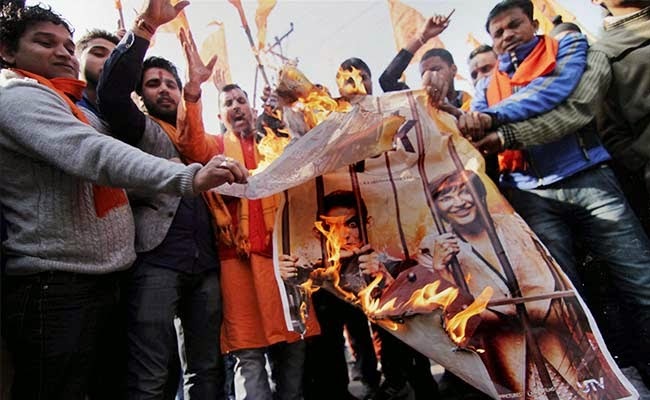 Right-wing groups intensified their protest against Aamir Khan-starrer PK on Monday in Ahmedabad and Bhopal, and are demanding a ban on the Rajkumar Hirani film. 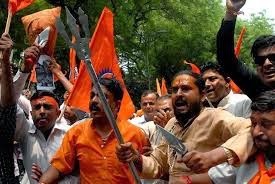 In Ahmedabad, Bajrang Dal activists protested against the film, which has generated controversy for its portrayal of godmen and their misuse of religion for personal gain, outside a theatre where it was being screened. The protesters smashed windows and raised slogans against the film. The group took out a protest in Bhopal. Both states are ruled by the BJP. On Saturday, yoga guru Baba Ramdev expressed his anger over PK and said the movie should be boycotted by the people. In an interview to a TV channel, Ramdev said, "These days any random person comes up with objectionable statements against Hindu religion." Right-wing groups intensified their protest against Aamir Khan-starrer PK on Monday.Right-wing groups intensified their protest against Aamir Khan-starrer PK on Monday.While a number of FIRs have been registered across the country against the film, Baba Ramdev asked Hindus to unite and protest against the movie. In a reference to Aamir Khan, Baba Ramdev said, "It seems like big personalities are fond of insulting Hindu deities". Last week, an FIR was lodged against the film under Sections 153 A, 295 A of Indian Penal Code on December 23. Prashant Patel, the secretary of the Hindu Legal Cell, has apparently lodged an FIR against director Rajkumar Hirani, Aamir Khan, producers Vidhu Vinod Chopra and Sidharth Roy Kapur. Agra: Accusing actor Amir Khan of double standards, and advising him to go to Pakistan, Bajrang Dal and Vishwa Hindu Parishad activists jointly intruded into the Shree Talkies here Sunday evening to disrupt screening of the film PK. They tore posters of the film inside and outside the cinema hall, shouted anti-Amir Khan slogans and asked managers to immediately stop screening of the film. Madan Sharma of the Bajrang Dal and Rajendra Garg of the VHP criticised Amir Khan saying that he was displaying his anti Hindu sentiments by ridiculing Hindu gods and goddesses in the film. Mumbai: A few theatres in Mumbai stopped shows of Aamir Khan starrer "PK" on Monday after threats from religious activists who allege that the movie insults Hindu gods and want it banned. 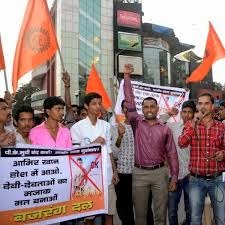 A theatre owner in south Mumbai's Parel said he had no choice but to stop screening the film after being threatened by activists allegedly belonging to the Vishwa Hindu Parishad or VHP, an affiliate of the ruling BJP's ideological mentor Rashtriya Swayamsevak Sangh. "We are soft targets. Around 40 people came to the theatre and said stop the screening or we will ransack your building," Punit Shah, the owner of Deepak Talkies, told NDTV. The vandalism was condemned on social media even though opinion is sharply divided on the Raj Kumar Hirani film about an alien who exposes a self-styled godman. Two rival hashtags - #BoycottPK and #WeSupportPK - are competing for attention on the micro-blogging site. "This film is much more a general comment on how ppl chase religion for wrong reasons and not for spirituality," tweeted Dilip Cherian. PK, which released on December 19, has smashed several box-office records. The Censor Board has refused to delete scenes from the film, saying "it's already out for public viewing."